Make your dreams a reality with Goals - Road Map To Riches. 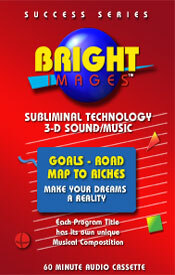 Now you can achieve the success you desire and deserve - all you need is your good Road Map To your Riches. Riches are available in many forms. Your mind is your greatest asset. It potential is unlimited. Create harmony from within to satisfy your positve, conscious goals. Become a better decision maker, that can make quick, accurate and positve decisions to follow your plan for success. Use your mind to enhance your position in life with your unlimited potential. You will have whatever you believe as long as you believe in yourself and your ideas.